Had our second appointment at the OB today. Its been over 3 weeks since our last one so needless to say I was a little bit nervous about what would be in there. You read a lot about late 1st trimester missed miscarrages but it seems the little one is doing fine! He/she has even more than doubled in size since the last time that we went to visit. And what was really awesome is that it looks more baby like now. It was sort of hard to get all mushy about a blobby bean, but this new gummibear looking baby is kinda cute. Hehe. Anyways doctor says baby is healthy and we should come at the end of next month. I also got my blood taken which cost me a lot more than I wish to recall. *sigh* for non insurance covered births/prenatal appointments in Japan. I had a few throwing up episodes last week but that seems to have gotten better recently. I have this whole week off so I guess I’ll just spend it trying to relax and stay warm. I am trying my darndest to get in the holiday spirit at the moment. But feel like I’m lacking quite a bit. Since I realized I don’t have any sort of Christmas music on my computer I’ve turned to the power of online radio and am currently listening to the Christmas Music 24/7 channel. Hoping that it helps… and it does, even just listening to the music brings me back to Jr. High/High School when I would put them on my radio boom box and listen to them all night long. Gah, I miss home so much right now. I have tiny bouts of homesickness through out the year… although I’m not sure if its homesickness or longing for the past. I miss University a lot but not so much the high school period. But even though my University was 7 hours away by plane I always came home for Christmas. So thats really the one time I’ve ALWAYS spent at home… well except for the 4 years I’ve been in Japan. So next year I think I need to go home. I just can’t seem to get Christmas-y by myself and Ryohei’s really no help with that although I was surprised to learn that his parents gave him and his brother a Christmas present each year. Seems sort of unusual for a Japanese family. I guess once babes is here I’m going to have to try and infuse some sort of of Christmas spirit or else go home. I suppose I’ll need to buy a tree and get some decorations/lights at some point. I do miss “real” Christmas trees though. When Nay and Naoki were here on the way home one day some foreign guy had a tiny mini real Christmas tree which I could smell and it just made me sooooo nostaligic for home and going to pick out our Christmas tree from the big Target parking lot. I’m already feeling like I’ve been whacked with the hormonal bat. And I can’t get throughout a day without…. C. Being cranky – ok sometimes I was cranky before I was pregnant but now its A LOT, esp. at work… but I mean its work. I have an excuse there. This is all compounded by the fact that Ryohei has been very busy lately. He’s been “working late” or “going on” pretty much every day this week, including tonight. And its impossible to fall asleep before he comes home because thanks to the layout of our apartment err… one room. Him coming in will wake me up and then going back to sleep will be harder. This weekend we are just taking it easy. I’ve been having a lot of fun lately having going to Tokyo, having guests, etc etc but I think I just need to take it easy. I went to the clinic for the first time today and there was indeed a heart beat and a small babylike.. err blob.. on the screen. But it was my baby… so maybe things will really start hitting me now that this is real. I have to admit I was a little nervous about what they would find, I haven’t had any issues until now so I was praying that there would be a visable baby and of course a beating heart. So I was put at apprx. 7 weeks with an EDD of July 21st. Which is pretty much in line of when this child was made. Anyways the clinic I’m going to now is pretty nice. Nothing incredibly fantastic but the doctor on staff Weds. and Fri. is a woman which for some reason makes me feel more comfortable. I was asked to come back in another 2 weeks for another “confirmation” check. Guess I’m not out of the woods yet. Oh and apparently one of my ovaries is swollen… any clue on what that means? The doctor said it was fine because pregnancy hormones can do that but we have to keep a watch on it. 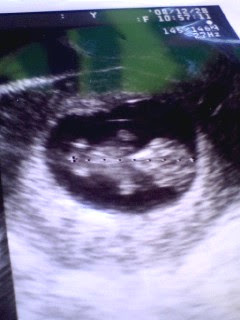 Anyways without further ado my little jellybeans first pic! Not too exciting but you can def. see my little one! !